Singer Adele canceled her June concert in Seattle, complaining of laryngitis. Now we have a good idea why. Friday night (Aug. 12) in a sold-out show at Seattle’s Paramount Theatre, the British neo-soulstress, who doubles (triples?) as a gay icon and plus-size role model, did more than exercise her powerful voice. 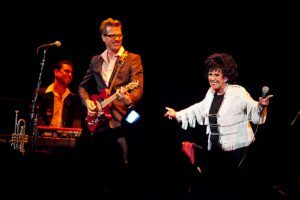 The North Londoner also chatted incessantly, often cattily, between songs, accenting her rapid-fire, often-impenetrable commentary with one of the most wicked laughs imaginable. And, yes, her lyrical themes (well, theme) seem yet more instrumental to her triumph. 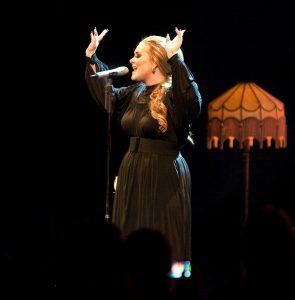 Her intensely personal lyrics struck a resounding chord Friday with a singalong version of the piano ballad “Someone Like You,” even if the otherwise deeply affecting song suffers from a remarkably clunky chorus. Adele’s lyrics tend to feature, well, far more heart than art, falling prey to the random metaphor. And her taste in cover songs is similarly more drippy than trippy; introducing a version of The Cure’s “Love Song” (in an arrangement intended for Barbra Streisand, Adele professed), she mentioned that at one time her young mother was obsessed with the now-late Jeff Buckley, but did she sing a Buckley song? Jackson knows a bit about inexplicable international hits, as her 1958 “Fujiyama Mama” (“I can cause destruction, just like an atom bomb”) went to No. 1 in Japan. And like Adele she paid tribute to the late-too-soon Amy Winehouse (“She inspired me,” Adele said) with an “age-appropriate” version of “You Know I’m No Good,” from her current album produced by Jack White. 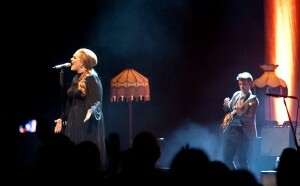 Watch a video of Adele performing “Rolling in the Deep” by following this link.